Just a quick question…how often can you use these? Are they safe to be used on a daily or weekly basis? If you have a Whole Foods store near you they should have Nettle in Tea form which would be easier to dunk in the water instead on in a loose form. Horsetail comes in vitamin capsules. Fresh parsley should be found in a good market along with Rosemary; if not use the dry seasonings; I would rather use fresh. I hope this helps. There are several different kinds of nettle, and I believe at least one of the species grows in Florida-Heartleaf nettle is its common name I think. 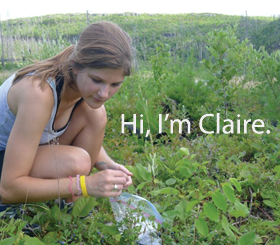 Nettle is a rampant weed here in MN, but I couldn’t tell you exactly how prolific they are in FL. I order mine online, dried, in bulk during the ‘off-season’, and have had great success with both that and the fresh. As other folks have said, health stores often times carry it as well. Hope this helps! You can actually find it in a Hispanic grocery store. I actually stumbled across it along with chamomile and valerian root. I did a Google search for “horsetail” and results showed weed, plant, grass and herb… can you tell me which is called for in your recipe? and where I can find the correct variety? I love you site too!! Thank you for sharing your wealth of knowledge 🙂 However, I’m old school, and when I see something I want to try – which is just about everything… I try to find the print button so I have it in hand to follow – I cannot find it!! 🙁 How do I print this?? 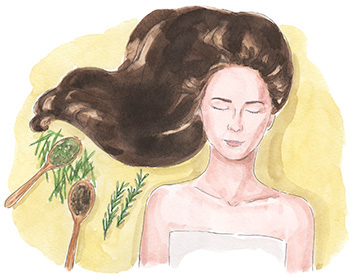 Have you ever heard of Rosemary and Sage brewed into a tea, used as a rinse, to help tone down grey hair? how long is the shelf life for the rinse? I love all of these, but it doesn’t say how to store the last 2. Do they all go in the fridge and use when needed? Thank you! WHAT IS HORSE TAIL? I HAVE HORSES. DO I GET IF FROM THERE TAIL HAIR? Question: when you say whole food store are you talking about a health food store and or bulk store??? you have to go to a manager and ask them to carry it with the name of the product and name of the company that makes it… I just asked my store to start carrying Almond oil he said he would get it in…they first order a small shipment to see how it sells…once they get it in !!! Like here’s an example: Wal-marts carries the Super washing soda and so does the other grocery store here called Public’s but Win-Dixie doesn’t so i asked the manager at Win-Dixie if he would he said sure just give me the name of it and the name of the company that makes it….I went a step futher i went to Amazon.com where you can buy it online and printed out the picture of the product with name of it and company name…now when i go to that store i’ll give it to the manager and he’s get it in…. 🙂 I hope this helps you girls !!!! Luv to help !!! 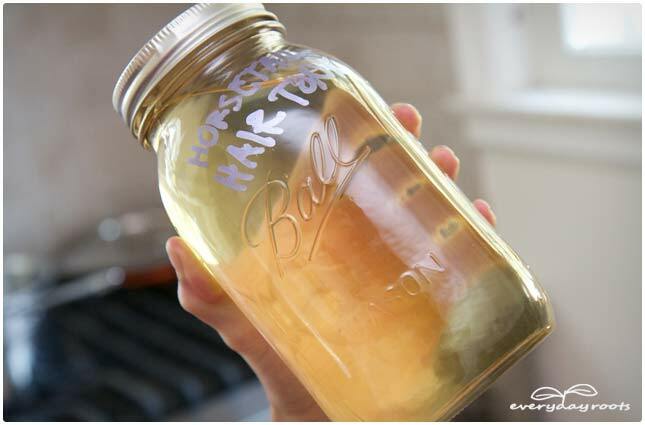 Do you use the whole jar full per one rinse? 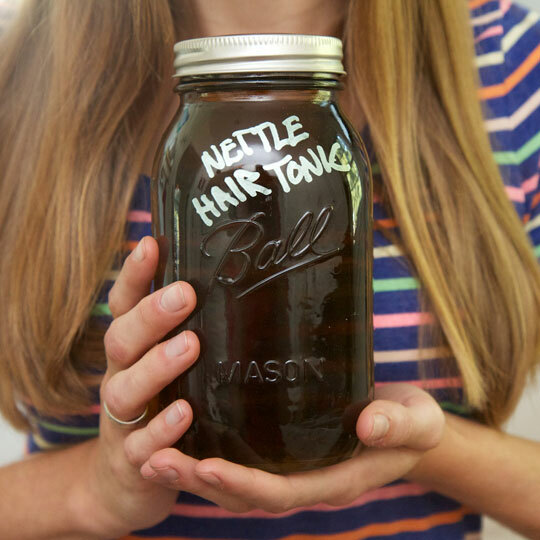 Nope just enough to wet your hair-I have long hair though, so its close to a full jar sometimes. Putting it in an old shampoo or spray bottle can help control the amount that comes out if you find yourself spilling too much. 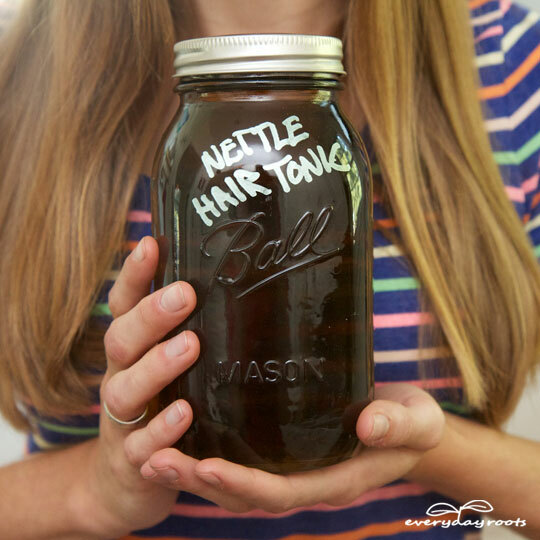 My question concerns the Nettle Hair Tonic. I have lots & lots of what we call ‘stinging nettle’ growing in my back yard. Is this the nettle you refer to in the recipe? 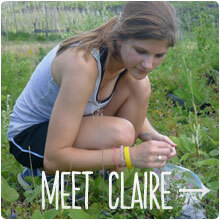 Also, my intuition tells me the nettle needs to be harvested in the Springtime before it flowers & goes to seed. Is this true? More specific information. Please. Stinging nettles is the best to use. Use thick plastic gloves and caution because it stings even with the slightest touch! Then clip off the top half and hang in a cool, dry place to dry. The nettles are better harvested during the blooming stage. This plant is well worth the trouble but make sure you identify it properly. After it dries use the same gloves to crumble into jars. Makes a good tea. I have been drinking Nettle tea (I buy it loose at a local organic place) as it is supposed to help with allergies and as a side effect, My hair (which I started loosing from a medication and injury) started to grow back and lots of the new growth has my original dark hair so much so that my hair dresser asked me what I was using as she saw remarkable growth in it. I shall try these on the outside too. I usually rinse with Apple Cider Vinegar. 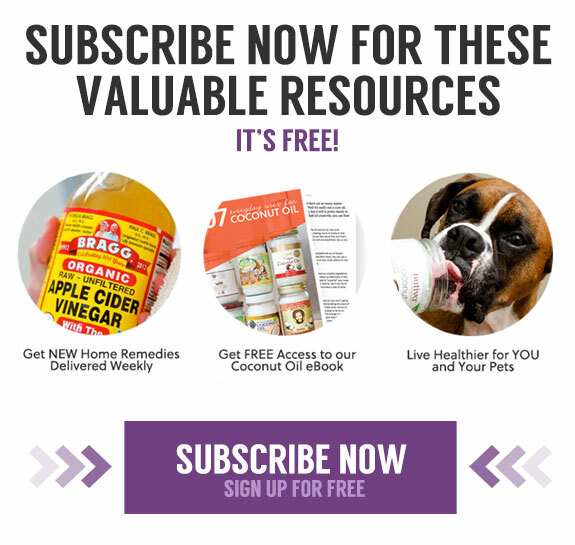 Do you think I could mix ACV with one of your rinses and store them together or should I store them separately and mix just before using them? 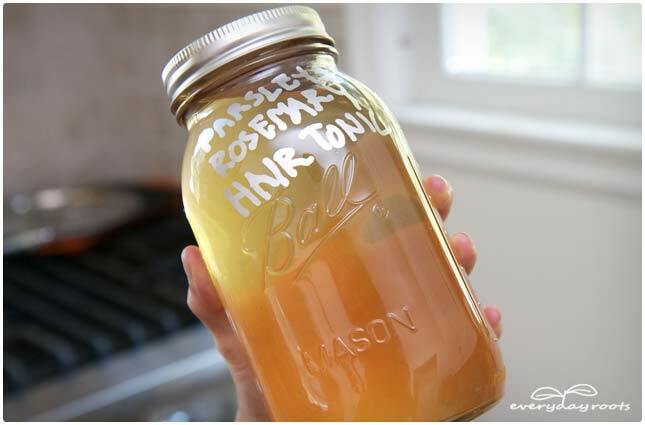 For the horsetail and the parsley seed/rosemary tonics, do they have to be used right away or can they be stored? And for how long? I can hardly wait to try this thank you. Love this recipe. I’m considering doing the same thing with marshmallow since I’ve heard it’s good for hair too. BTW, what size mason jar is that? 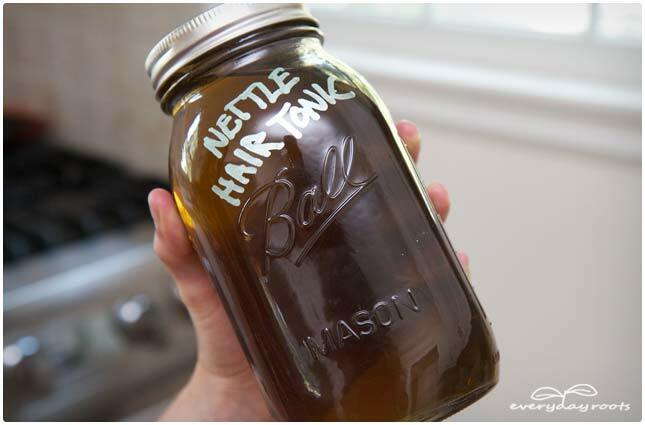 I was wondering if I could use nettle leave capsules with the hair oil instead ? Hi! I was wondering do I use these after I shampoo and condition or is this a replacement for shampooing ??? 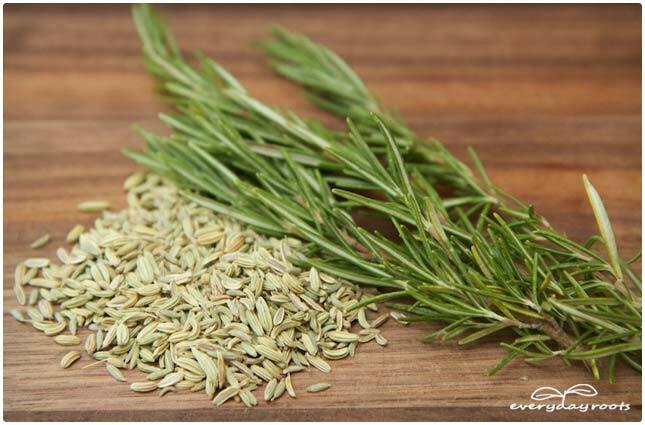 Hello Claire, I was wondering if dried or fresh parsley could substitute for the parsley seed/ rosemary tonic? Also while it’s always preferable to air dry hair, would it take away the benefit to partially blow dry at the end? Thanks! Great Post. Thank you for the information. 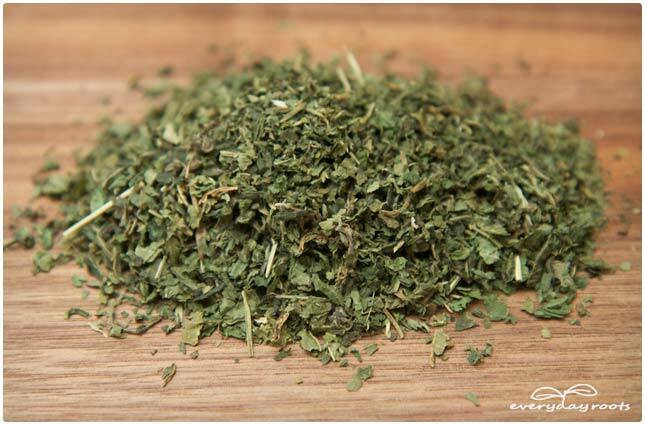 We have lots of nettle at ther ranch. Will one of these work on someone who has psoriasis? Thanks for reading. Can you use all the herbs together in one tonic? Thanks. I was wondering the same thing as Kat. 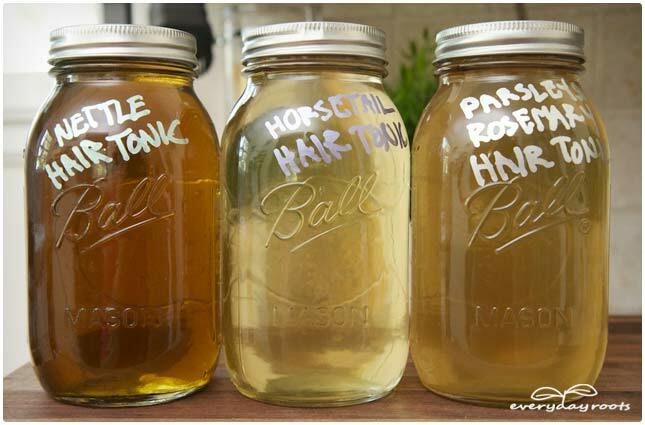 Could you combine these tonics into one? I have been “brewing” my own nettle/rosemary/horsetail tea for some time. I usually leave it in the pot overnight, then put it in the refrigerator. I take out a small container of it, add the same amount of ACV, and take to the shower. I then mix 50% with warm water, put on my hair, rub gently into my scalp and let it sit while I shower (Be careful! It will fall onto your face, and the AC will sting, so rinse face periodically with water). when I’m done showering, rinse it out of your hair, then proceed as usual. ( I do not use heat on my hair: no irons/dryers, etc.) My hair has NEVER been so soft! As another poster mentioned, you can use these as teas for consumption as well…which I do every now and then. I also only use shampoo soap, usually a rosemary/nettle mix, from several vendors that make them up, using only organic, no chemicals, etc. Have done this for several years, and my hair has only a few grays in it (I’m 60). I, also, am wondering, is this a replacement for shampoo, or an addition? Hi. 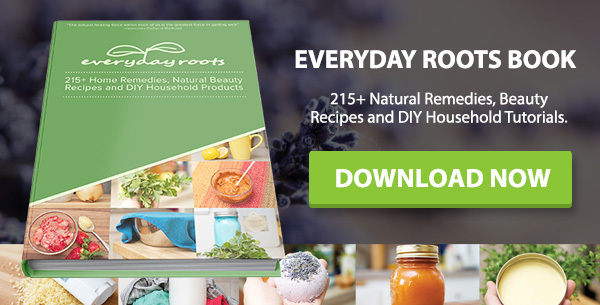 Just wondered if you have more natural recipes to help restore natural hair color and get rid of gray. Also to stimulate growth for thinning hair. Can i use indian nettle for nettle tonic..? Can I do my own combination of these? or Do they have to be as stated to be effective? Is a conditioner needed? I have a sensitive , healing scalp, thyroid issues and hashimotos. My hair is curly/ wavy and very delicate. I’m experiencing some hair loss . What would you recommend? Hi can all the rinses be put into one?